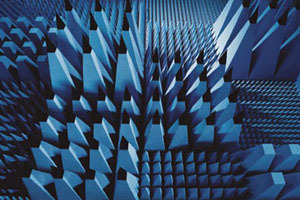 Emerson & Cuming Microwave Products manufactures a set of standard geometrically shaped absorbers for use in anechoic chambers. Of all absorber types, the geometrical tapered absorbers offer the best reflectivity performance. All act by means of a dielectric loss mechanism. The pyramidal shape (or a convoluted in the case of the ECCOSORB CV) functions in two ways : first, it creates a continuous impedance taper which allows the wave to enter the material with low reflection and gradually attenuates the energy as the wave gets deeper into the material; and second, it scatters the energy into different directions, allowing a wavefront to be partially transmitted into the material at several interfaces within the valleys of the absorber. These materials show easily reflectivities better than -50 db when the thickness of the absorber is more than a couple times the wavelength. In most cases we can satisfy our customer’s demands concerning chamber performance with these standard solutions, but our R&D and Engineering groups can also provide state-of-the-art customized solutions for special demands. These standard materials are also sold as loose items to end users or turnkey partners, who take care of the integration of these materials in a (non)-shielded room. As an ISO9001-2000 company we pledge that all our products at least comply with the technical specifications mentioned in our technical product information. Consequently the end user, who has his chamber build with Emerson & Cuming MP materials, can be 100% sure that his facility will work according to his expectations. 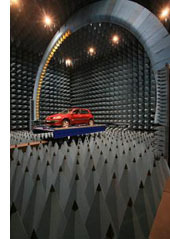 Please note that all anechoic pyramids and convoluted absorbers are manufactured in our Westerlo, Belgium facility and as such lead times can be longer than normal. However, a generous inventory of VHP and CV materials are kept in stock at the Randolph, MA facility for quick deliveries. Contact a sales & applications engineer for more information or purchase small quantities through our buy-online page.